A flyer for Emma and Dan’s Route 6 Journey hangs from the fridge at the Harborcreek home of the Perritano family. Sixteen-year-old Emma Perritano’s face lights up whenever she catches a glimpse of it. So far, she is enjoying the journey, eagerly waving her hands when they pass someone on the street. All the while, humming her favorite songs, a collection of tunes from Wicked, Disney movies and some old-fashioned rock ‘n’ roll. Her parents, Penn State Behrend men’s soccer coach Dan Perritano and college registrar Jane Brady, said it’s exactly what they hoped for. What they’re doing is a 360-mile trek across Pennsylvania’s historic Route 6 to help raise funds for the Arc of Erie County. Emma is a non-verbal life skills student at North East Middle School and has benefitted from the Arc, which provides advocacy and support for individuals with intellectual and developmental disabilities and their families. 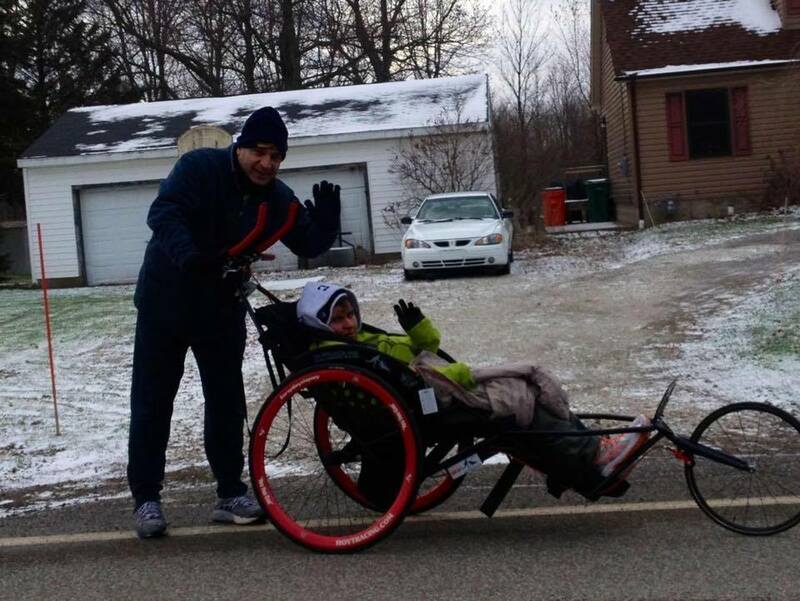 Dan is pushing Emma in her Team Hoyt running chair, a custom-built chair designed for physically-challenged individuals that was purchased through grants from ACHIEVA and Billy’s Friends Foundation, two non-profit organizations for persons with disabilities. The two have already begun checking off some of the western miles on Route 6 during weekend outings. The duo hopes to finish at least 100 miles before setting out on May 18 to finish the trip. “Once we get on the road, we aren’t coming back,” said Perritano, who will use the MapMyWalk app to track completed miles. Perritano said the two average about 15-minute miles when moving consistently, and he hopes to do between 15 to 20 miles per day. “The plan is to do 10 or 11 miles in the morning, have lunch and then do maybe another 10 in the afternoon,” he said. Perritano said they won’t carry many supplies and will mostly rely on purchasing things on the go. However, if supplies get too low, Perritano does have a lifeline. “I can’t imagine them going three of four days without me coming to the rescue,” Brady said. Perritano plans to finish the journey on May 30, but knows challenges could arise. Hazardous weather could cause a delay, so he said the completion date is tentative. To learn more about the Arc or how you can contribute to Emma and Dan’s Journey, please visit their website at thearcoferie.org or contact Arc president Dr. Karen Morahan at kmorahan@edinboro.edu or Dan Perritano at dpp2@psu.edu. Follow Emma and Dan’s Journey on their Facebook page. It was hour 32 of THON, and Taylor Hennon ’13 had hit the wall. She was exhausted and sleepy. Her emotions bordered delirium. This is all par for the course with THON, Penn State’s 46-hour dance marathon designed to raise money to support children and families as they combat pediatric cancer. But then came Mail Call, an event during THON weekend in which dancers receive letters and packages from friends, family and supporters to inspire and motivate them to continue dancing. Hennon had no idea she was about to receive the biggest pick-me-up imaginable. The final letter she read came from Timmy Donovan ’13, her boyfriend, whom she first met five years earlier during a trip to Germany while they were both students at Penn State Behrend. For Donovan and Hennon, THON, which was held February 20-22 this year at Penn State’s Bryce Jordan Center, was the perfect venue for a proposal. For the past four years, it’s been a staple in their relationship. For the proposal, Donovan used Hennon’s grandmother’s ring, which made the moment even more meaningful. Following the proposal, it was not long before the entire Bryce Jordan Center caught on to what was happening. “There was this moment where I opened my eyes and looked around, and the entire Bryce Jordan Center is watching us and applauding. It was surreal,” Donovan says. The timing of the proposal also helped reenergized Hennon, who danced independently in this year’s THON. From that point on, she was excited to share the news with her mother, who joined her on the floor of the Bryce Jordan Center around 7 a.m. Sunday morning. According to Donovan and Hennon, the significance of THON in their relationship cannot be understated. While at Behrend, the two both became involved during junior year and as seniors, Hennon was Behrend’s THON chair, and Donovan was a dancer. 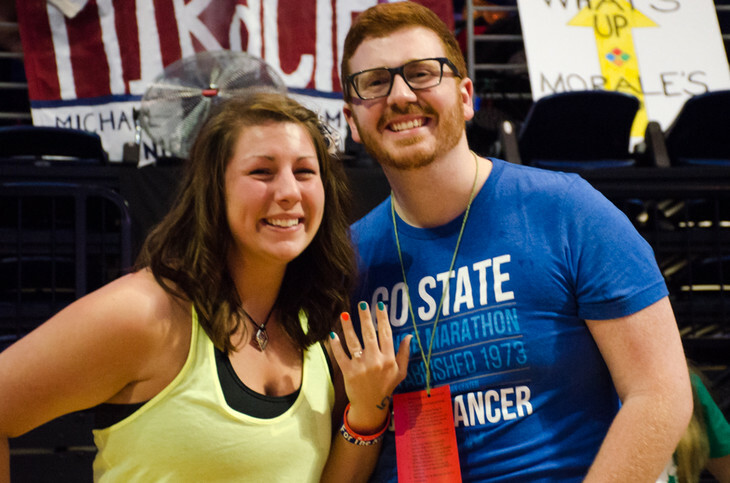 Throughout their involvement, the two endured a breakup, but their connection to THON kept them close. Shortly after graduating from Behrend, the two got back together. Regardless of what journey awaits the two, THON is certain to remain a crucial part of their lives and relationship. They have already planned to include members of their THON family, Rylee and Dalaney Dorer, in their wedding. 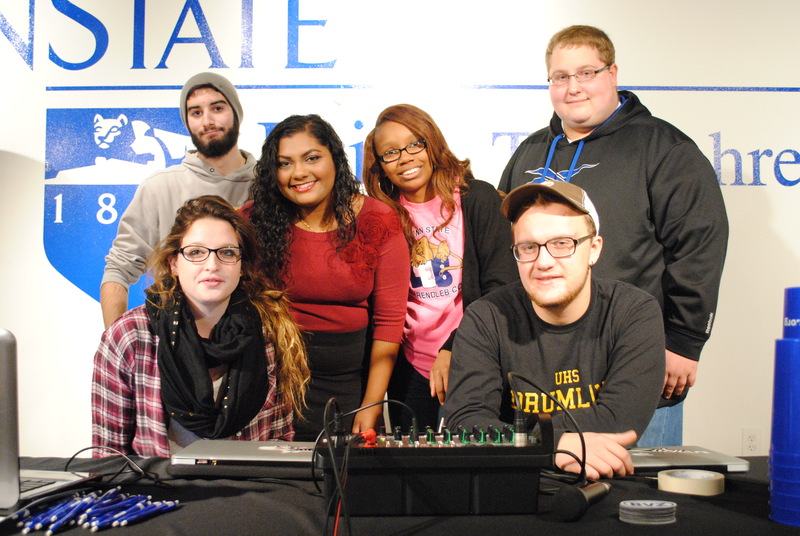 DJs from BVZ Radio entertain the Behrend community through their weekly Hump Day broadcasts. Students (left to right) Anna Waterson, Zach California, Rayna Ganabathi, Monique Lebrun, Ethan Buckley, and Joseph Rock are some of the DJs who broadcast. In need of a midweek pick-me-up? BVZ Radio has just the thing for you. Every Wednesday, from 11:00 a.m. to 1:00 p.m., DJs from Penn State Behrend’s student-run radio station broadcast from the stage in Bruno’s Café. They take requests during the broadcasts, which have been appropriately named “Hump Day” in honor of the day they fall on. The first broadcast proved to be a success; by the final hour, students were requesting songs via text message and Twitter. Housing and Food Services was pleased with the response as well. They invited BVZ Radio back to do weekly broadcasts, and Wednesdays are now one of the busiest days at Bruno’s each week. It’s also helped with recruiting for the station. With finals week right around the corner, Hump Day has now ended for the semester, but it will be back again next year. There are even talks of expanding the live broadcasts to other days as well. “We hope that BVZ Radio continues to expand. That’s what will ultimately get more students involved,” Lebrun says. To send in a Hump Day request, tweet BVZ Radio at @BVZradio. To learn more about the station, visit their website. Up for some traveling this holiday weekend? How about a trip to the moon? 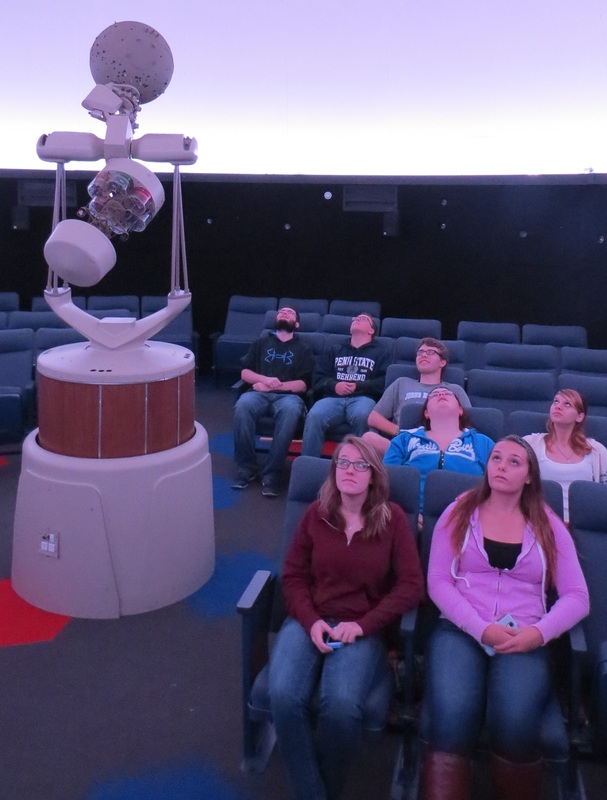 The Yahn Planetarium at Penn State Behrend, a newly-renovated 55-seat astronomy theater that opened earlier this month, will be open on Saturday. The planetarium, housed in the college’s School of Science Complex, will offer two public shows at 1:00 p.m. and 2:30 p.m. The 1:00 p.m. show, “Back to the Moon for Good,” follows teams as they race toward the moon and compete to win a $30 million Google Lunar XPRIZE. Penn State’s Lunar Lion Team is featured in the program, which is narrated by Tim Allen. The 2:30 p.m. show, “The Sky Above Mr. Rogers’ Neighborhood,” is an introductory and interactive show recommended for ages 2 and up. The show follows X the Owl as he tries to save the moon from being taken out of the sky by Lady Elaine. Admission to the planetarium is $5 for adults and $3 for children ages 12 and under. For more information, visit behrend.psu.edu/yahnplanetarium or call 814-898-7268. Far from Home is an occasional series in which we document a year in the life of international students at Penn State Behrend. When Craig Miranda’s alarm went off at 6 a.m. last Thursday, he awoke with a feeling of eagerness. His friends warned him it was coming, but some things need to be seen to be believed. Craig Miranda had never seen snow until last week when the Erie region received more than foot of precipitation in 24 hours. The Kuwait native had never seen snow before last week when the Erie region received nearly a foot in the span of 24 hours. In Kuwait, summer temperatures can exceed 120 degrees. Even in winter, average daytime temperatures rarely fall below 60 degrees. Miranda says he longed for snow and cooler temperatures when he decided to come to college in the United States, so last week’s storm was a welcome sight. As the day went on, more snow began to accumulate. Overall, Erie received 12.6 inches of snow, the earliest occurrence of a snowfall of this magnitude for the region. The heavy snowfall might have been a burden for others, but Miranda remained enamored with every flake that fell. He even shared his happiness with his family back home. For Miranda, the snowfall helped paint a picture of the holiday season, which he had only ever seen on television before. “I’ve always pictured Christmas as caroling with snow falling from the sky, but I’ve never seen it until now,” Miranda says. Given that he chose to attend college in America’s snowbelt, last week was probably only the beginning of the fun for Miranda; last year, Erie recorded 138.4 inches of snow fall and earned the honor of America’s snowiest city. His friends have warned him that he might eventually tire of the snow, but he’s not buying it. The name “Behrend” was well known in the Erie region long before Penn State Behrend ever existed. Hammermill Paper Company, one of the region’s largest employers for nearly a century, was owned by Moritz Behrend and his three sons, Ernst, Otto, and Bernard. Thousands of people worked for Hammermill from 1898 until 1984 when the company was purchased by International Paper Company. 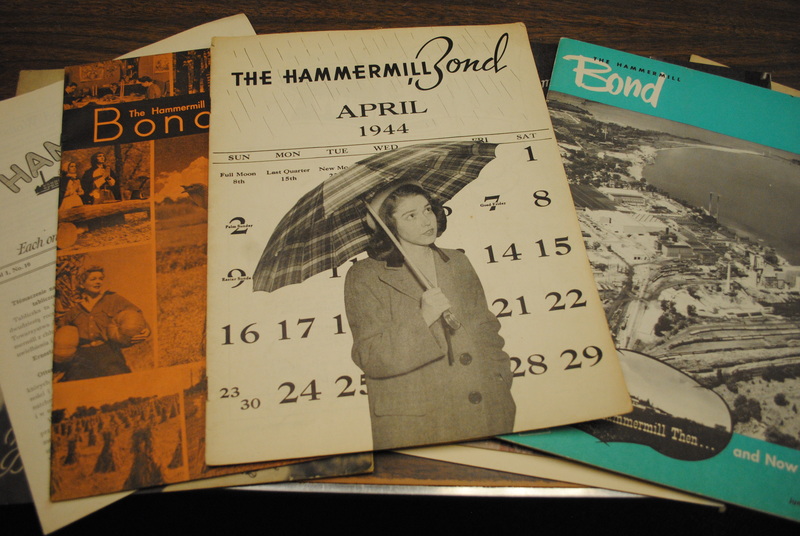 To communicate with its employees, Hammermill published a newsletter, The Hammermill Bond, which is now digitized and archived as part of the Hammermill Paper Company Collection at the John M. Lilley Library at Penn State Behrend. In the past, Ingold handled requests for old newsletters. Now, family members of former Hammermill employees can access them on their own. The newsletter is available to anyone; you do not have to be a Penn State user. The Hammermill Bond was first published in 1917, and it continued through the 1960s. The only break in publication came during the Great Depression. A step above traditional company newsletters, the publication included interesting feature stories, colorful covers, and rich photography. It was much more reminiscent of a modern-day magazine than a newsletter. The Lilley Library currently has a display commemorating The Hammermill Bond. Various issues are featured, including the issue that was printed following the death of Ernst Behrend in 1940. The display will remain at the Lilley Library through Monday, November 24. To access the digital archives of The Hammermill Bond, click here. Moustafa Elhadary had the perfect plan. He and his friends, Khalifa, Saeed and Murrawi, were all going to attend Penn State together. While they would be enrolled at different commonwealth campuses, they planned to reconvene regularly on weekends to travel, attend football games and sightsee. The group had it all mapped out, and thought it was the perfect way to make Penn State feel like home away from home. Then came some somber news. Elhadary, who has lived in Dubai since 2007, was ineligible for the draft since he is a native of Alexandria, Egypt. While he did not have to serve, the fact that his friends would not be joining him in Pennsylvania was hard to accept. Rather than dwell on the negative though, Elhadary opted to focus on the positive. Everything about the United States has been new and exciting for him, and he’s pledged to make the most of it. 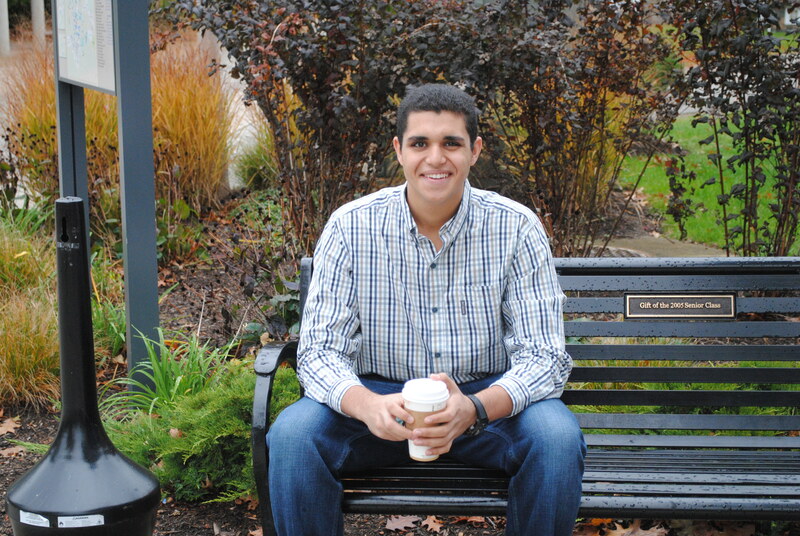 Elhadary is a member of Behrend’s International Student Organization and Muslim Student Association. He plans to become a resident assistant next semester. He has even experienced some physical changes since enrolling at the college. He can thank his karate class for that. He says he still gets homesick and misses his parents and sister, Safinaz, but he works to find other things to occupy his time. This December, during winter break, he will return home to see his family. Elhadary is looking forward to the visit, but he says he will be happy to return to Erie for the start of the spring semester. And he has learned that his friends who are currently serving in the military are planning on enrolling at Penn State Behrend when their service time is up.